Hummingbirds are on their way to you! In fact, they may already be in your area waiting for your backyard to be ready for them to nest and live in this summer. Sure you can put out a hummingbird feeder, but with a little planning and innovation, you can have a hummingbird-friendly backyard that both the birds and you will enjoy! Plant flowers hummingbirds like that bloom throughout the summer. This will mean planting a few varieties, but it makes for an even more beautiful garden for you! Hummingbirds love water in the summer and they especially love misters to keep cool and keep their feathers clean. Installing a mister will make your yard popular with hummers as well as a lot of other birds! Invest in a nectar feeder that will attract them and you can easily clean and fill – if you attract hummingbirds to your backyard you are going to be busy so make it easy on yourself, too! Learn to make your own hummingbird nectar and keep it in the fridge. It’s less expensive and better for the birds than many store-bought nectars. 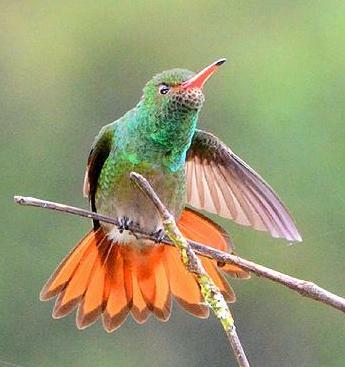 Avoid the red-colored nectars sold in stores as they can be toxic to hummingbirds. Sign up for Audubon’s Hummingbirds at Home and find the information you need on hummingbirds from the experts. For more detailed information, read this terrific article by Scott Weidensaul on Audubon online, and look forward to a great summer of hummingbird watching!